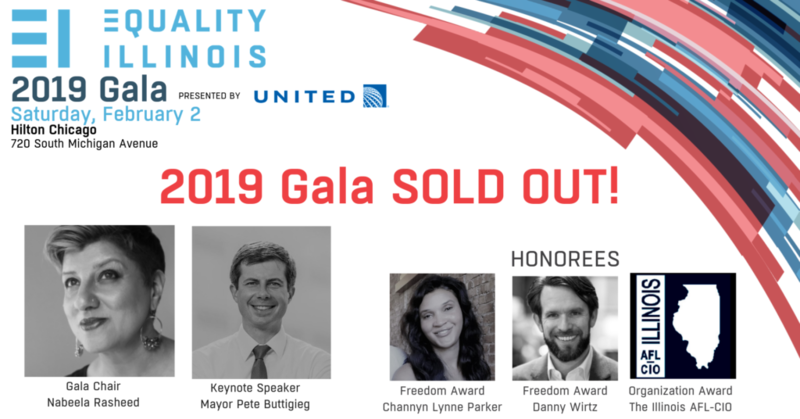 Equality Illinois Posts Uncategorized Equality Illinois 2019 Gala SOLD OUT! Equality Illinois 2019 Gala SOLD OUT! As of today, the largest formal LGBTQ equality event in the Midwest, the Equality Illinois 2019 Gala has SOLD OUT of Individual Tickets! We are incredibly grateful for the breath of support shown to the LGBTQ community. Selling out a venue like the Chicago Hilton demonstrates how important LGBTQ people are to the fabric of this state. If you will be joining a sponsor or table captain at one of their tables, please reach out to them for the link to secure your ticket. This year’s Gala is chaired by community leader Nabeela Rasheed. South Bend, Indiana mayor Pete Buttigieg, a rising national star among Democrats, will be the keynote speaker! Each year we award inspirational leaders and organizations whose selfless work helps create a world that is healthy, just and fully equal for all LGBTQ people. This year we will celebrate and honor Channyn Lynne Parker, Danny Wirtz, and the Illinois AFL-CIO.